You can spend hours visiting the impressive monuments, memorials, and buildings around Washington, DC. The National Mall makes the perfect starting point; many of the most famous and popular sites stand within walking distance of one another, and in a single afternoon you can visit many of the spots you might only have seen in books or online. The Washington Monument, Thomas Jefferson Memorial, Lincoln Memorial, United States Capitol Building, and the White House are some of the most popular sites to visit on the National Mall. The Mall is also home to the Vietnam Veterans Memorial, Korean War Veterans Memorial, World War II Memorial, Martin Luther King Jr. Memorial, the Reflecting Pool, the Franklin Delano Roosevelt Memorial, and the Albert Einstein Memorial- among many others. While the monuments are free and open to the public, a tour of the White House or Capitol Building requires some advance planning, so check their websites before you plan a day around visiting them. Even if you just focus on visiting the monuments, the National Mall is the perfect place to walk around, explore, and experience the best of what DC has to offer. If you’re starting to feel the heat from a day of walking around the National Mall, take a break and visit one of the many museums in DC! Some of the most popular museums are the National Air and Space Museum, the National Museum of Natural History, the National Museum of American History, the National Museum of African-American History and Culture, the National Museum of the American Indian, the National Gallery of Art, the International Spy Museum, and the Library of Congress. These museums are all located within a short distance from the National Mall, and many are located on the Mall itself, so you won’t have to walk far to find an interesting museum to visit. Almost every museum in DC is free, but a few do require an admission fee. Be sure to check their websites for hours and information. The best part is that exhibits change often, so even if you have visited a museum in the past you’re almost guaranteed to see a new exhibit or two! Washington, DC and the surrounding states of Virginia and Maryland provide a multitude of opportunities to immerse yourself in American history. After you’ve stopped by the museums and taken photos of all the famous monuments in Washington, we recommend renting a car and heading over to Maryland or Virginia to see even more! Just south of DC, Old Town Alexandria in the state of Virginia is a great place to explore; you’ll find museums, historic sites, and lots of great restaurants and shopping. Virginia is also home to the hallowed grounds of Arlington National Cemetery and multiple American Civil War battlefields, all within a short drive of DC. In the opposite direction you can drive into the state of Maryland to visit historic Annapolis, home to the United States Naval Academy and incredible sea food from the nearby Chesapeake Bay, or you can drive north to Baltimore and visit Fort McHenry, the inspiration for the American National Anthem. You won’t have trouble finding great food options in DC! The international nature of the city attracts some of the best restaurants and chefs from around the United States and beyond. You can find just about every type of food in DC; everything from traditional American cuisine to foods from far-away countries. A few of our favorite spots are Ben’s Chili Bowl, Old Ebbitt Grill, Martin’s Tavern, Ted’s Bulletin, Ambar, and Founding Farmers. The DC area always has something going on when it comes to entertainment. There are multiple arenas and venues around town that host concerts, events, theater performances, and conferences, and the city is home to multiple professional sports teams. 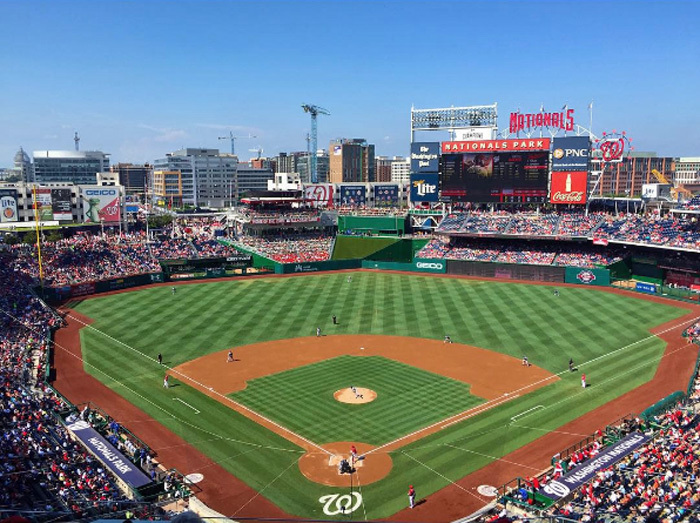 We always enjoy going to a Washington Nationals baseball game in the summer or a Washington Wizards NBA game in the winter. If Washington, DC isn’t on your travel to do list, we hope you add it so you can experience a few days in the USA’s capital! DC has a lot to offer, and whether you have a few days or a few weeks, you won’t run out of fun things to see and do! Thanks again to Adam & Stephanie for their wonderful post about Washington, DC. I’ve always thought that Washington would be a fascinating place to visit, but this post provides an excellent summary of the diverse nature of what’s there, along with some good advice. Washington seems spectacular! I love this guide, Tanja! great post! D.C. is a wonderful place to visit, and i especially love the many interesting national museums around the mall – you can walk from one to the other, and they’re free, and full of so many different and wonderful things. i also love the spy museum; i haven’t ever come across a museum like this anywhere else. don’t know when we’ll be making it to the US, but looks like we need to put DC on the visiting list 🙂 thanks for a great post! Very nice overview of what you can do in Washington DC!! It’s true that it never occurred to me to visit this town but it seems worth it, especially for the Lincoln memorial, looks interesting! Great overview of things to do in DC! This makes me miss it. We moved away over two years ago. Old Town Alexandria was right by where we lived, and we absolutely loved going and walking those beautiful streets! I agree Annapolis is a great place for a day trip as well!